Size: up to 4 feet or more. Growth Form: Shrub; ascending several trunks; stem segments firmly attached, green; tubercles prominent, narrowly elliptic to ovoid. Leaves: Leaves modified into spines or glochids and emerging from areoles; spines 11 to 18 per areole; whitish, pale yellow to pinkish tan to reddish, aging brown or black. Flowering Season: March to May. Elevation: 350 to 3,500 feet. Habitat Preferences: Sandy flats, rocky hillsides, boulder fields, bajadas, desert chaparral, pinyon-juniper communities. 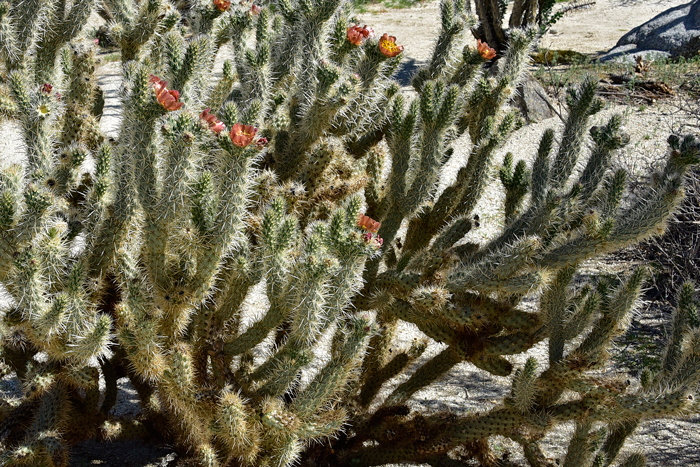 Recorded Range: Gander's Buckhorn Cholla is rare in the United States where it is found only in far southwestern California; eastern San Diego County and south Riverside County especially in the Anza Borrego desert and nearby areas. 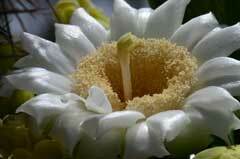 It is also native to Baja California. North America & US County Distribution Map for Cylindropuntia ganderi. 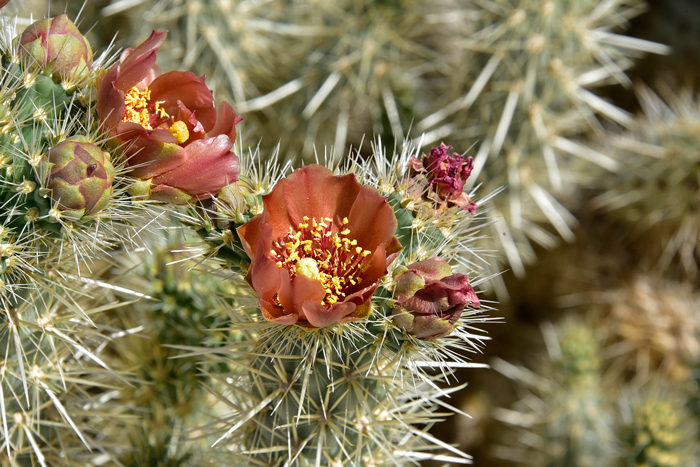 Comments: Gander's Buckhorn Cholla is a rare Cholla in North America and, in the United States it is limited to extreme southwest California, east and north of San Diego. 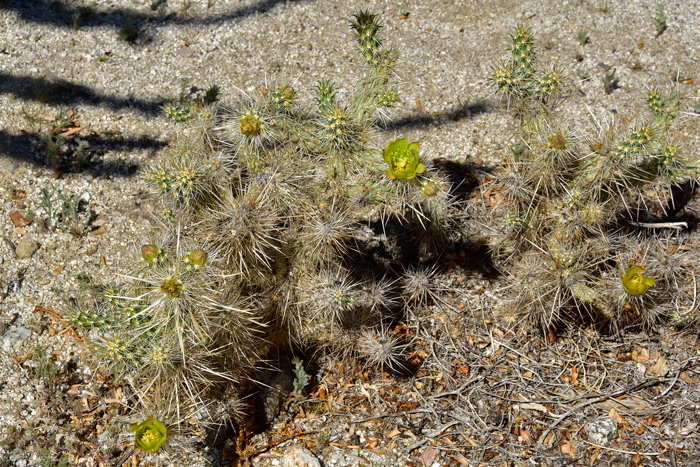 This species is said to hybridize with C. californica var. parkeri in the north part of its range. In Southwest Desert Flora also see: Buckhorn Cholla, Cylindropuntia acanthocarpa, Arizona Pencil Cholla, Cylindropuntia arbuscula, Teddy Bear Cholla, Cylindropuntia bigelovii, Jumping Cholla, Cylindropuntia ganderi, Klein's Pencil Cactus, Cylindropuntia kleiniae Christmas Cactus, Cylindropuntia leptocaulis Walkingstick Cactus, Cylindropuntia spinosior and Baja Pencil Cholla, Cylindropuntia tesajo. Donald J. Pinkava, FNA | Family List | FNA Vol. 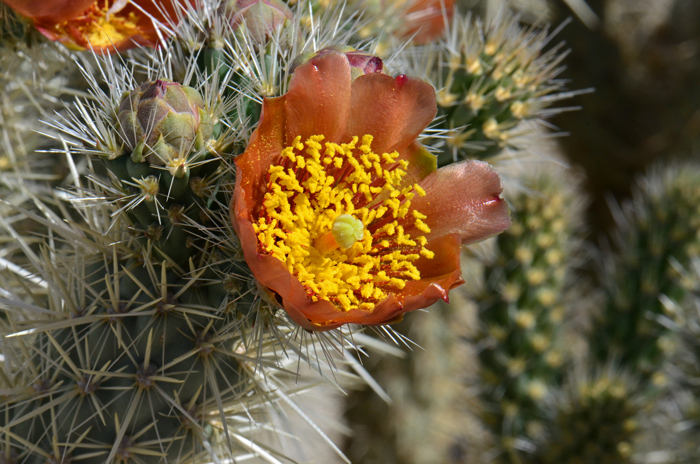 4 | Cactaceae | Cylindropuntia | 18. 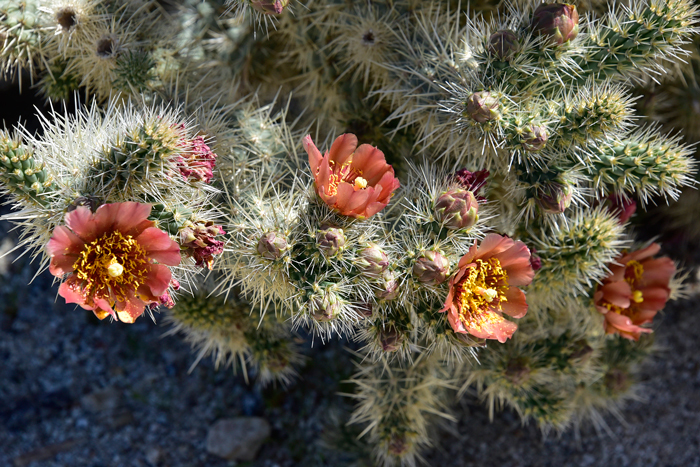 Cylindropuntia ganderi (C. B. Wolf) Rebman & Pinkava, J. Arizona-Nevada Acad. Sci. 33: 150. 2001.; Flora of North America Editorial Committee, eds. 1993+. Flora of North America North of Mexico. 16+ vols. New York and Oxford. http://ucjeps.berkeley.edu/cgi-bin/get_IJM.pl?tid=80397, accessed on August 20, 2017. SEINet synonyms, scientific names, geographic locations, general information - (accessed 08/20/2017).